In the early twentieth century, Evansville was a hub of automobile manufacturing, producing bodies, parts, and assemblies for several different makes of cars. 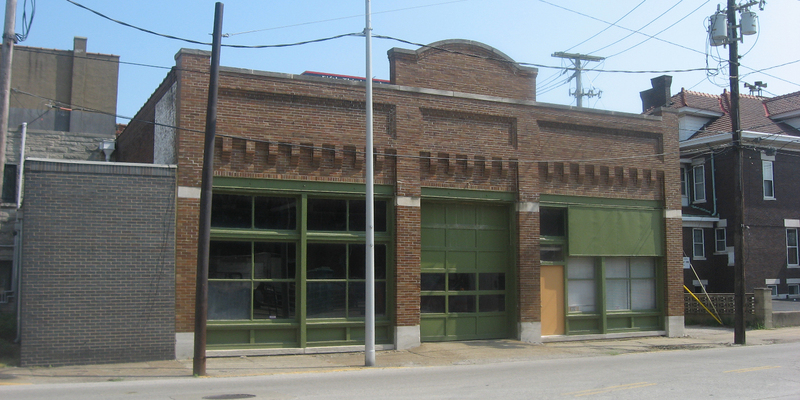 A pair of buildings near downtown represent part of the city’s earliest automotive history. 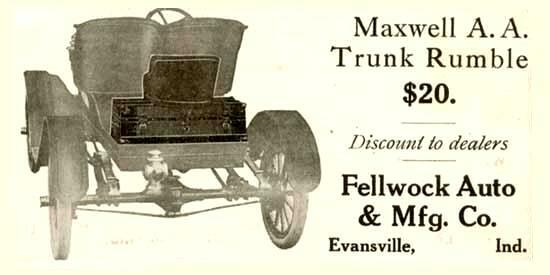 In 1907, the Fellwock brothers – William, Paul, and John — established the Fellwock Automobile & Manufacturing Company to capitalize on the city’s burgeoning auto industry, drawing on their background in furniture manufacturing to making detachable seats, tops, and windshields for smaller “runabout” auto models. The brothers also established a salesroom and garage, where they sold and serviced Maxwell, National, Mitchell, Stoddard-Dayton, and Baker models. 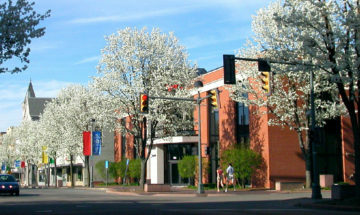 By 1908 business was booming, and the company constructed a new garage at 315 Court Street. 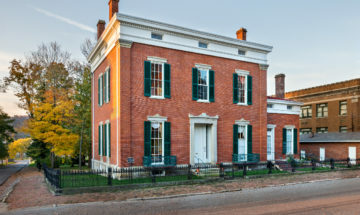 Though modest in style, with a dark glazed-brick facade and limestone trim, the building boasts the unique claim of being the first building in Evansville constructed expressly for the purpose of servicing motor-powered vehicles. The company continued to expand its business, joining with Evansville Carriage Works to craft custom bodies for on Cadillac truck chassis to serve as ambulance, police cars, delivery vans, etc. In 1916, seeking a new and modern image to distinguish their business from buggy makers, the brothers changed its name to Fellwock Auto Company. In 1922 the company commissioned local architects Shopbell & Company to design a new showroom and dealership. 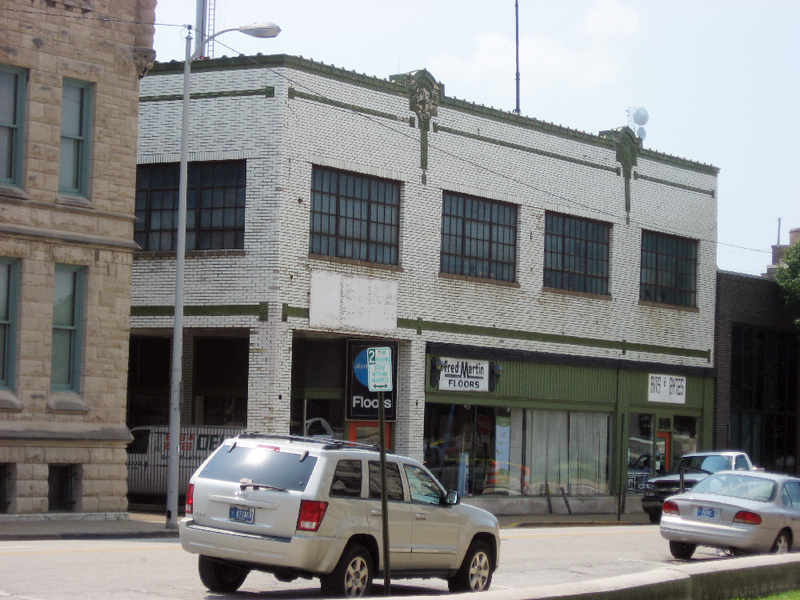 The new building, at 214 NW Fourth Street, incorporates hallmarks of the Prairie School style, including horizontal windows, white enameled bricks, green terra cotta ornaments. Inside, an elevator carried vehicles from the basement to the second floor. The Fellwock Auto Company eventually ceased operations, but both buildings remain in use today – the garage is a deli, and the dealership houses a flooring business. 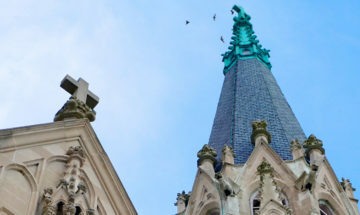 Check them out next time you’re in Evansville, or when the city hosts Preserving Historic Places, Indiana’s Statewide Preservation Conference this April 9-12.